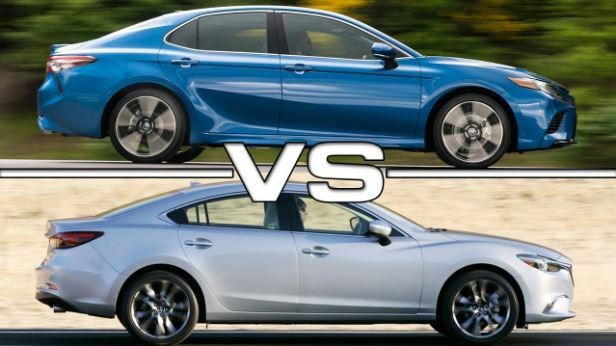 Toyota Camry 2018 Or Mazda 6, Who Is Stronger? Sedan of the new generation became stronger. How much? To find out its strength, we compared the newcomer to the time-tested countrywoman Mazda 6. Both rivals are equipped with similar in return for 2.5-liter engines and 6-speed “automatic”. Let’s see which of them is stronger? Moderate aggression is emphasized by the dynamics of the lines. In the eighth lap of the Toyota Camry, like Cinderella, turned from inconspicuous servants into a queen of the ball. At the same time the model remained recognizable – it’s Camry 2018 – no doubt! You can argue only on the color: the sedan changes color, like a chameleon – depending on the lighting and angle of view. From coal black to dark blue. Or dark green ?! At this point, the editorial staff did not reach a consensus. Toyota 2018 is 15 mm longer than Mazda 6 (4885 against 4870 mm) and five higher (1455 mm). The width of the sedans converges to a millimeter – 1840. However, the wheelbase of the “six” is more by the elusive 5 mm, and the ground clearance – by a centimeter: 165 to 155 mm from the Camry. Despite the age, the Mazda 6 is still strong. Sports design, comfortable and high-quality interior is as well as excellent driving performance. This Japanese sedan, focused on the driver, offers all the tools for dynamic movement in space. And at the same time gives something that can not be measured with roulette or money – the pleasure of driving. In general, a cool car! However, Toyota Camry 2018 is stronger. The sedan, built on the new TNGA platform, has changed beyond recognition, both externally and internally. It’s a completely different Camry! With driver pepper in the chassis and serenity of the rear sofa. « When Toyota Camry 2018 Is For Every Taste, Which Version Would You Choose?